I had to smuggle Blackie in and out of hotels, since dogs are generally unaccepted in public places, even (shockingly) in parks. Luckily, Blackie is a peaceful dog with a quiet demeanor, never barking. I made sure that the “do not disturb” sign was up at all times, and called hotel housekeeping when I needed towels or toilet paper. We did well. We picked out a nice Japanese made, airline approved, plastic crate for Blackie at the animal hospital, confirmed his “seat” in the flight cargo area and were ready to go. Minutes before the flight at the airport. After 15 hours of flying and waiting, Blackie lazily waltzed out of his crate, stretched his little paws, had a pee and started exploring his new home with great interest. Soon, he was running, spinning and sliding around on the wood floors, freely. A few days later, he met his new furry brother, Tommy. It took a week of adjustment time before the dogs started playing together. I almost cried a tear of joy and cuteness-overload, when I first saw the dogs tugging at a rope toy together, or the time they fell asleep next to each other at the foot of my bed. Awwwww…. A happy family, at last! 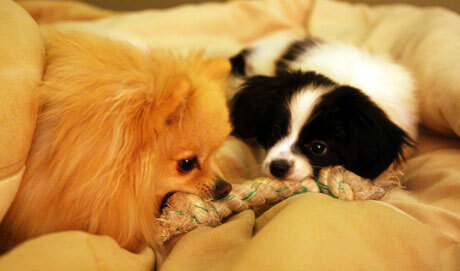 Playing tug war with Tommy. It’s been roughly 2 months since we first picked Blackie up in Beijing, he has since doubled in size, now weighing a sturdy 5.5 lbs. And just recently, small signs of black dots are starting to show on his front legs, resembling a Dalmation. Blackie’s hobbies include napping, taunting Tommy and biting everything in sight. His favorite napping spot is on top of a small camera bag under my desk. You’ll often find him there, curled up in a ball. 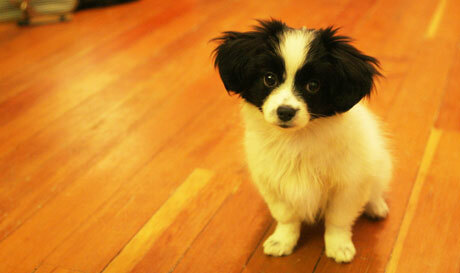 For those curious of Blackie’s breed, he is a Japanese Spaniel Mix (日本狆). 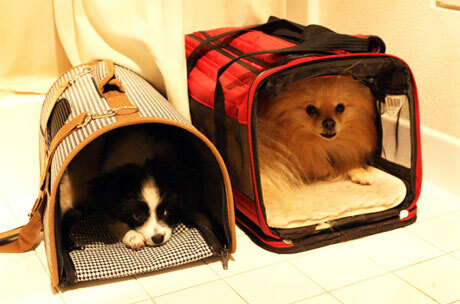 “Roommates” – sharing the bathroom together in their respective ‘houses’. 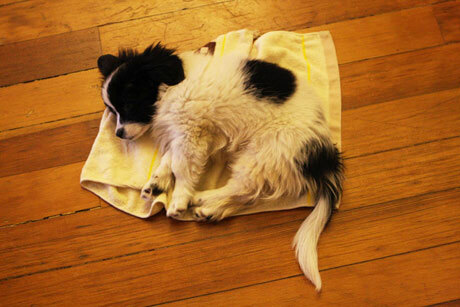 Napping on his towel after a hard day of playing. An Unexpected Encounter: Impulse or Destiny? The following details my experience with preparing my dog to move from China to the US. 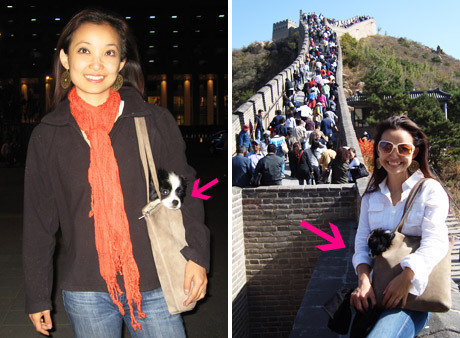 Hope this will be helpful for other pet owners traveling with their pets out of China. Getting the paperwork done was time consuming and I highly recommend finding someone who speaks Mandarin to go with you. You need to make two stops. Go to a government approved animal hospital. There are only a few in each major city. Apparently, it’s a pretty standard procedure to prepare an animal for export. After the checkup, blood test and exams, they’ll give you an exam report. Hand the exam report to the registration window and wait. It needs to be signed by the head doctor and stamped by the hospital to be considered official. Waiting can take up to an hour. Check back at the registration window regularly, as they tend to forget to call you when it’s ready. I waited around 20 minutes for this. The result is a hospital issued health certificate. Take the hospital issued health certificate and head to a government issuing office. The vet will give you the address. Be sure to ask someone there to write down landmarks near the office so taxis will know where it is. Go to window that says Export (it’s written in Chinese), or if that window is closed, go to any of them and tell them you need pet export paperwork. Fill out a form. Hand it in at an adjacent office. Wait. When the waiting is done, they give you a case number and a computer print out. Waiting time can range between 10 minutes to 60 minutes. I waited around 30 minutes. Take print out to the export (or neighbouring) window. More waiting as they prepare for the official government issued documents. Waiting time is minimum of 1 hour. I caught their lunch break and waited 2.5 hours. The result is two blue papers. The export permit and health certificate issued by the government are both valid for 14 days. Airfare – $275 on air canada and counts as one check-in bag. 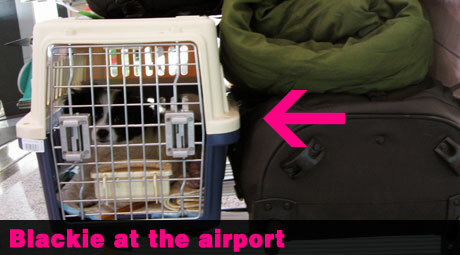 When checking in pets you go through a different channel than checked bags. After checking in at the counter and relieving yourself of all your check-in luggage, you wait with the animal until the actual plane is ready and confirms that the animal section of the cargo area is safe and at the right temperature. We had to wait until 30 minutes before took off to check him in. Then we took him to the over-sized luggage drop off, sent him through x-ray, showed the blue health certificate and then they had a person bring the crate directly onto the flight. After this point, you don’t need to show the blue paperwork again. The Chinese immigration, when exiting the country, do not care about it. The bag security is the only place that needed it. The US immigration didn’t say a word, even though the box for “Bringing Live Animal” was checked off. This entry was posted on Thu, Nov 20, 2008 at 4:52 pm and is filed under China, pets, Tina, Traveling. Email this page. This post brought tears of joy and happiness to my eyes! Blackie is the luckiest dog to have both you and Tommy in his life :) The three of you make an adorable family. I’m wishing you all the best! I’ve just came here via your Think Simple blog. I just read all your posts about Xinjiang and Beijing. I’m an expat living in Guangdong province, exploring the Chinese side of my heritage and am also a big fan of personal development and read Steve Pavlina and Zen Habits. I was contemplating visiting Xinjiang but now your colorful pics of Kashgur culture has cemented it. I’d also love to visit Mongolia as well. We’ve got a nearby Xinjiang restaurant that serves these awesome noodles and I’m always envious at the western and eastern blend of their looks, not to mention those gorgeous hazel and blue eyes. I’ll keep looking forward to your posts here. That is the cutest pup in the *whole* world! And you had to travel around the globe to find him. What a doll. 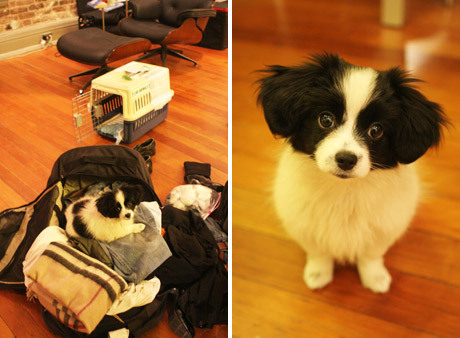 Blackie is way cuter than a Japanese Chin. He does not have the bulging eyes that is typical of a Japanese Chin. Blackie is really cute and the photographs are great too! It was shocking when I read that dogs are not allowed in the park. Then where do dog lovers hang out in China? Dog lovers hang out at people’s homes, their backyards (if any), on city blocks, and at animal hospitals (also doubles as pet salon). An interesting observation, very few pet owners actually use leashes when walking their dogs along the sidewalk. The dogs are trained to follow the owner. Aww, I love the updates about Blackie! Robin & I had a few marks on our fingers from his teething, but they have long since healed. ;) I am glad to hear that Blackie and Tommy have become used to each other. I just have to say that Blackie has got to be Thee Cutest Dog I Have Ever Seen; I am a cat person, so I don’t say this lightly! ;) I’m so very happy that you rescued him from that creepy mean couple and brought him into your loving home. 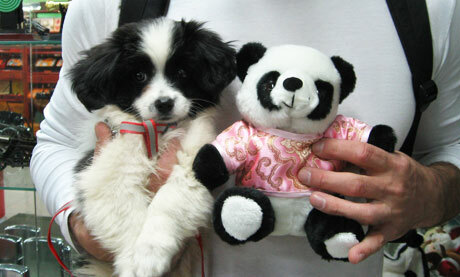 Do you know what Blackie’s Japanese Spaniel heritage is mixed with? We’re not sure what he is mixed with. If anyone have an idea based on his pictures, please let me know via comments. Sometimes, he also goes into Tommy’s house, while Tommy is still in it. It was pretty ridiculously funny to see the two of them squeezed into the same “house”. Blackie so cute!!! I think he looks like a gremlin! LOL, you should rename him Gizmo! Blackie looks exactly like our dog “FluffY” unfortunately for us she was killed by a Motorist many years ago.. this picture has brought back memories.. we are digging through our videos of fluffy. I have to say that Blackie is adorable and this URL has been sent to a lot of my friends and relatives! However, I was reading your previous posting (about how you came to own Blackie) and laughed at your comment about how Chinese think Westerners are walking dollar signs; this is also a perception by many other cultures about Americans–specifically, I am thinking of Eastern Europe where relatives would demand LISTS of items like leather coats (gee, something I might like to own? ), along with money. LOL! Anyways, I hope you are enjoying Blackie! I think that is a great thing you did. 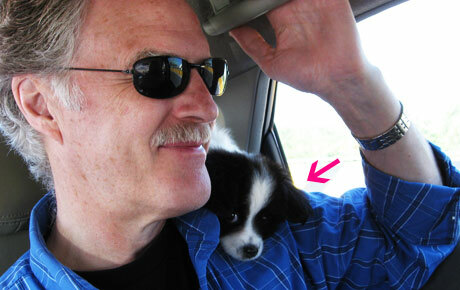 Thanks for saving a little puppy and adding him to your family. Seriously touching story. welcome to china ! r u a chinese? never mind but i’m a chinese .